Two black boxes from the Boeing 737 MAX airplane that crashed in Ethiopia arrived on Thursday in France for expert analysis, officials said, as regulators around the world awaited word on whether it’s safe to resume flying the jets. More than 40 countries — including the U.S., Canada, India, China and Russia — have grounded the planes or refused to let them into their airspace. A spokesperson for France’s BEA air accident investigation agency said the flight data and cockpit voice recorders have been delivered to France’s BEA air accident investigation agency. Their data are critical to finding out what caused the new aircraft to plunge to the ground shortly after taking off from Addis Ababa on Sunday, killing all 157 people aboard. Following the lead of other global aviation regulators unnerved by the second crash involving a 737 Max in less than five months, the U.S. Federal Aviation Administration (FAA) issued orders on Wednesday for the planes to be grounded. Boeing, which maintained its planes were safe to fly, said in a statement that it supported the FAA move. 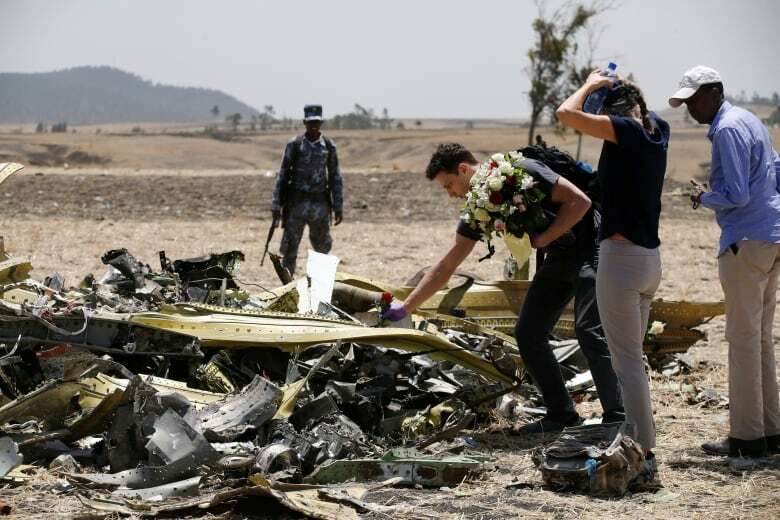 The FAA, the National Transportation Safety Board, the Ethiopian civil aviation authority and Boeing have been investigating the crash at the site, some 60 kilometres outside the Ethiopian capital. On Thursday morning in Addis Ababa, grieving relatives of some of the victims of the air disaster boarded buses for a three-hour journey to the crash site. Others described their visit on Wednesday to the arid farmland where the passenger jet crashed. “We saw where he died and touched the earth,” said Sultan Al-Mutairi, who had come from Riyadh to mourn his brother, Saad, who ran a recruitment agency in Nairobi and perished in the crash. Experts say it could take weeks or months to identify the victims, as their remains were scattered, charred and in fragments due to the impact of the crash and ensuing fire. Frustration is growing among the families of victims of the crash who are in Addis Ababa. On Thursday morning, many of them were asking Ethiopian Airlines for greater transparency. About 200 family members stormed out of a briefing with Ethiopian Airlines officials, complaining the airline has not given them adequate information. Airline officials said they have opened a call-in centre that is available 18 hours a day to respond to questions by family members. But angry family left the meeting at a hotel in Addis Ababa, saying there were not getting enough answers. Same cause as Lion Air crash? The weekend crash is the second since October that occurred just after takeoff. In October, a Lion Air plane crashed in Indonesia. 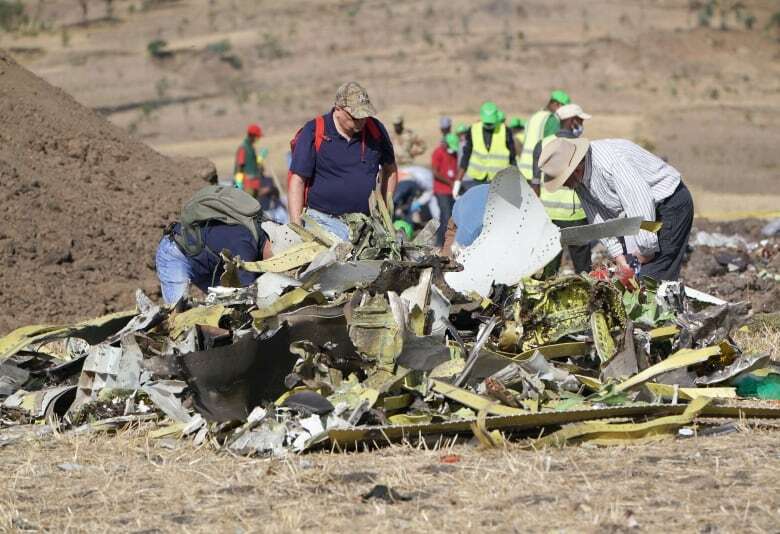 Fresh information from the wreckage in Ethiopia and newly refined data about the plane’s flight path indicated some similarities between the two disasters “that warrant further investigation of the possibility of a shared cause,” the FAA said in a statement. Airline pilots on at least two U.S. flights have reported an automated system seemed to cause their Boeing 737 Max 8 planes to tilt down suddenly. The pilots said the tilt occurred soon after engaging autopilot. In both cases, they recovered quickly after disconnecting the autopilot. Daniel Elwell, acting FAA administrator, said he did not know how long the U.S. grounding of the aircraft would last. A software fix for the 737 MAX that Boeing has been working on since a fatal crash last October in Indonesia will take months to complete, Elwell told reporters on Wednesday. Deliveries of Boeing’s bestselling 737 Max jets were effectively frozen, though production continued, after the United States joined the global grounding of the narrow-body model over safety concerns, industry sources said. With the uncertainty hanging over the 737 Max, a French presidential source said European plane-maker Airbus and Ethiopian Airlines are discussing a possible new contract as part of the airline’s fleet overhaul. The official said President Emmanuel Macron and Ethiopian Prime Minister Abiy Ahmed had spoken about a possible new contract during Macron’s visit to Addis Ababa earlier this week. Airlines operating the 737 MAX jets that have been delivered since its 2017 debut said they had cancelled some of their flights and rearranged schedules to use other jets in their fleets. “Our goal is to operate our schedule with every available aircraft in our fleet to meet our customers’ expectations during the busy spring travel season,” said U.S. carrier Southwest Airlines Co, the world’s biggest operator of the 737 MAX.